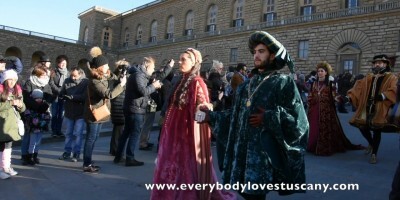 The Cavalcade of the Magi is an annual parade held on Epiphany in Florence. This grand parade has hundreds of participants dressed in costumes, flag throwers, animals and much more. The procession starts at Pitti Palace and ends at the Duomo where the 3 wise men present their gifts to a live nativity scene consisting of Christ, Mary and Joseph.